Want to get your feet wet? Interested in what it would be like to breathe underwater? Curious to explore the sea below the surface? So were we, and we loved it so much that we became trained as Scuba Schools International Instructors so that we can train you and open your doors to the beautiful and vast underwater world! Our Open Water Diver Certification Course is an easy 4 day program, home study course consisting of one academic sessions, one pool sessions, and two ocean sessions totally 4 ocean dives. In our Open Water Diver program we focus primarily on safety in the development of our students. Our goal is to produce divers who are confident, competent, reliable, and safe. Our courses are always made of small groups to give individuals more one on one attention from the instructor, improve safety, and create a more enjoyable experience. Learn from some of the best instructors in the state in a relaxed, friendly manner for a total of $450, the cheapest in San Diego. Please go to our Schedule Click here to see our calendar! to see the dates of any particular month. If you cannot make this schedule we do offer private Open Water Certification Courses that allow you to set your own dates and times, which can speed up the process tremendously and provide a better one on one experience with an instructor. If you would like to sign up for the course please come at least a week prior to the equipment pick up date for a quick orientation session when you will receive your SSI Academic Package, complete required paperwork, go over the course in further detail, and if need be purchase your snorkeling package (see below). 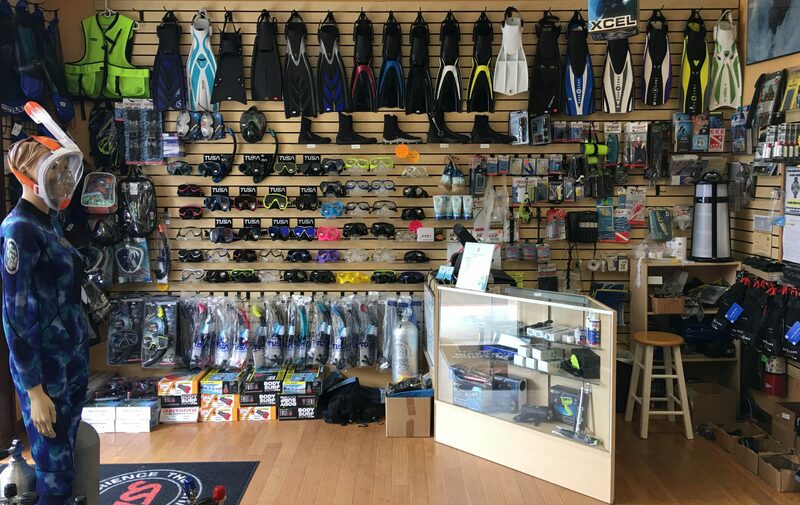 *Allow approximately 2-3 hours for academic and pool session, and plan to meet back at the shop after the ocean dives to rinse gear, receive new tanks, and sign required paperwork. Students can expect to be finished around noon on Saturdays. *Snorkeling Package: The course price of $450 includes scuba equipment rental (regulator, wetsuit, buoyancy compensator, tanks, weights, and gauges). For sanitation and safety reasons each student must provide their own snorkeling package which includes mask, snorkel, fins, gloves, and booties. All of these items can be purchased at the store. If students are to provide their own gear it must be approved by the instructor. Please note that scuba diving fins are very different from most other fins in that they must be more powerful and accommodate diving booties. Online Classes – SSI now offers a great option for new divers. You can now complete the academics portion of your certification class online. After completing the online course, you can continue your practical skills and assessments with the store. Please note: All students must provide mask, snorkel, fins, gloves, and booties. The fins, gloves and booties required for scuba diving are likely different than you may use currently for surfing, snorkeling or other ocean sports.